Sacramento’s Latino community became fragmented after the passing of Mayor Joe Serna in 1999. Serna was not just a civil rights activist, City Council Member and Mayor, but had been the glue that held the Sacramento Latino community together. Although several Latino community meetings were held to regain the coalitions that Serna had created, none resulted in a sustained effort. Instead, it took a scathing editorial published in the Sacramento Bee that asked, “Where have all the Latinos gone?” in response to the poor Latino voter turnout of the November 2014 election. 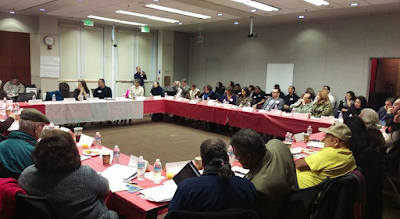 The article, written by Mariel Garza, a Latina, prompted a number of us to make calls and push for a general meeting where we could begin to plan the future of Sacramento’s Latino community. The first meeting, albeit a bit contentious, was held in January of 2015, with over 60 attendees representing themselves and varied nonprofits, and yours truly acting as moderator. It was not easy, after a couple of hours we all agreed on two resolutions: 1) To meet on a monthly basis; and, 2) To work on Eric Guerra’s campaign for City Council. At its second meeting, the group named itself the Sacramento Latino Community Roundtable (SLCR), a body not owned or governed by any person, group, or entity, with a focus to better the lives of Latinos in the region. Since then, the SLCR has met monthly, helped get Eric Guerra elected, and has collectively written letters to City Hall to ensure inclusion of Latinos in city government and its activities. Because of the many leaders and organizations involved, the group also decided early on that the SLCR would be structured as an unincorporated association, governed by guidelines rather than bylaws or Robert’s Rules of Order. With a simple agenda, a two-hour meeting time limit, no membership fees, open to anyone and rotating monthly hosts, the SLCR has attracted the attention of business, political, elected and appointed individuals. Moreover, it has established itself as a key group to engage for public policy development. Now in its third year, it’s been my honor to moderate most of these meetings together with past President of the League of Women Voters Lola Acosta. With a fluctuating number of attendees, from 40 to over 90, there is no question that the information shared at these meetings is invaluable, and the resources discovered continue to help the improvement of our Sacramento Latino community in the areas of education, economic development, and political empowerment. Si Se Puede! July 22, 2017 at 9:30 to 12:00 at the Robertson Community Center, North Sac.